In the winter of 1991, I attended my first Action Sport Retailer trade show in San Diego and I was introduced to the fashion business. 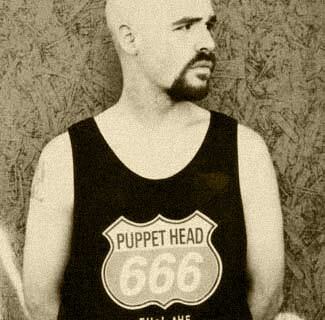 It was an exciting time in the industry, the clothing was wild and the music was groundbreaking. And there was a lot of interest in small companies and independent designers. I saw young artists selling unconventional garments and funky printed t-shirts. I remember thinking: I wanna do this! 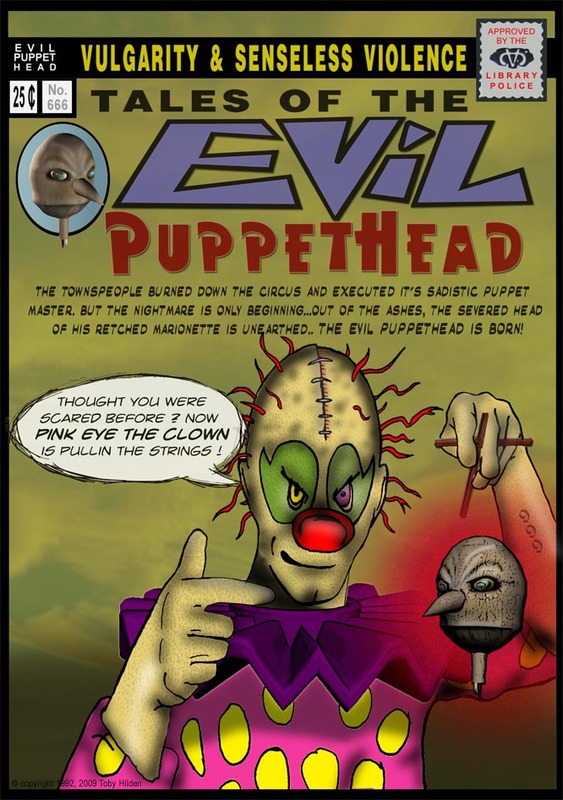 In 1992, I began my company Evil Puppethead Products. The starting point and the center piece of the line was the Evil Puppethead jug head hat. The next step was to create a series of t-shirts. 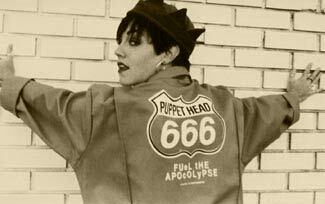 My design concept tied evil and 666 into my images. The 666 print became my best selling design for the next 2 years. Other designers were inserting their names into well known logos and pop culture references. I though it would be fun to do a mash up with comic book covers and created a group of fictitous super heros and villians. I also made prints of old style comic book ads: see through anything with 'x-ray specs and 'learn to hypnotize'. 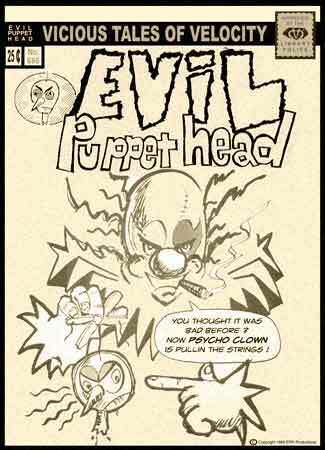 For the comic book line art, I utilized the talents of my friends: Chadd VanZanten, John Ewell and my brother Noel. Also as part of this line, I screen printed my 666 design on gas station overalls, and put an "Evil" name tag over the left pocket. The coveralls were a big hit! After the sucess of my first trade show I put a large portion of my profits into building up for the next one. I was really happy with my trade show concept. 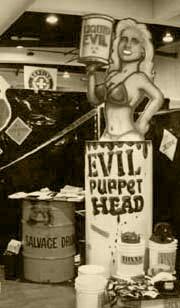 My booth and pre-show print advertising were tied around the images of the liquid evil girl. 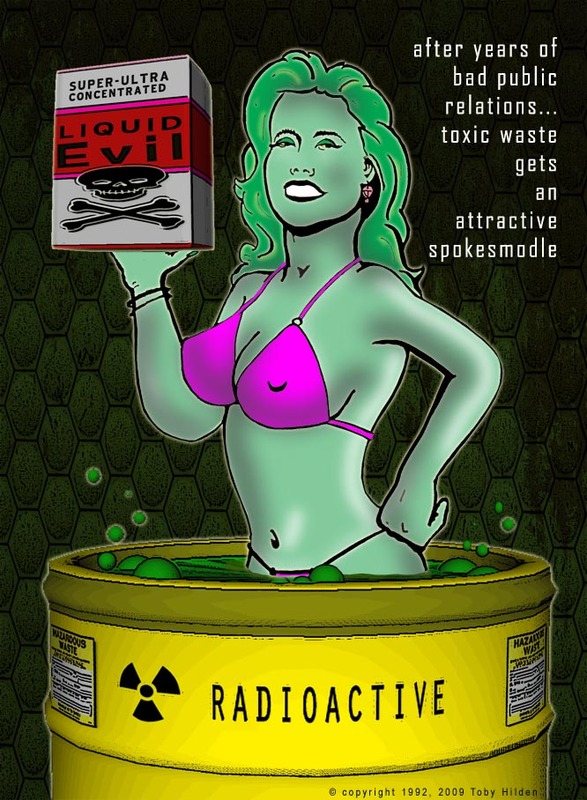 The joke being, toxic waste wouldn't have a bad rap if it had an attractive spokesmodel.